There can be no denying the power that digitalization and the mobilization of devices has delivered the superyacht industry over the past decade. These forces are truly global and far-reaching. The ability to bring departments together and have real time and detailed communication with shore support and yacht management is resulting in more reliable yacht programs. All of which result in better experiences for owners, guest and crew. A primary requirement for many Captains is to have transparency into what activities are taking place onboard. Is maintenance being performed when due? Are the interior rooms ready for charter? Has that major order arrived? Has the deck department completed fire drills this month? That said, the size of the vessel will often determine how much direct involvement the Captain has with the daily operations of the crew. For larger yacht programs, the Captain heavily relies on the department heads to relay back information relating to daily activities. Yacht management is a collaborative process, often with a number of moving parts. 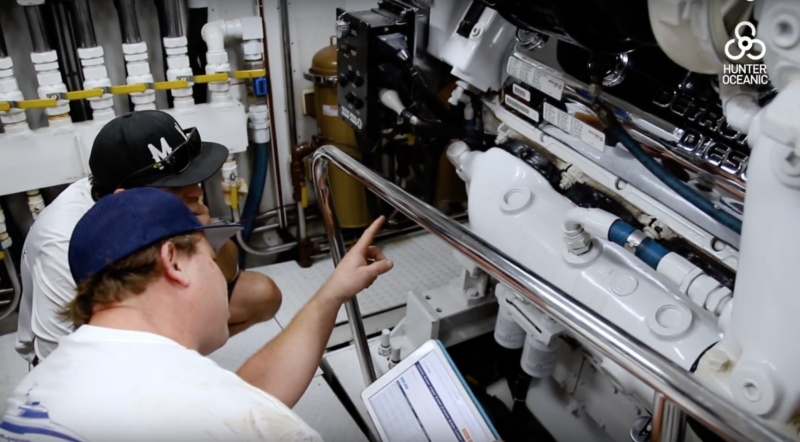 Digital solutions have played a significant role in providing Captains with tools to improve the communication process and the transfer of information between crew members. Collaboration between departments has significantly improved over the years. A contributing factor has been the evolution of software as a service (SaaS) or cloud based solutions. “When designing Seahub we wanted to improve the way information was not only captured but also shared. We wanted to improve the way information was shared with shore based support including yacht management companies and land based stakeholders” says Sam Wheaton, Director of Seahub. Yacht management software is a common phrase mentioned in the superyacht industry. Its definition can sometimes cast doubt of its purpose. Put simply, a yacht management software is a digital tool used to manage some or all of a yacht programs operations. Those who have implemented a yacht management software, more specially, a planned maintenance system, are enjoying the benefits of reduced human error in record keeping, clearer lines of communication, allowing for the remote sharing of information as well as the obvious benefits that stem from a more maintained and tracked vessel. “A superyacht can be an intense environment for crew, particularly on charter. Complete transparency is required between crew and their respective departments. Any lack of communication or collaboration can greatly disrupt a charter or owners trip” says Wheaton. Seahub bridges the gap in communication between departments, shore support and yacht managers. Digital daily logs can be entered into Seahub and sent ashore and monitored by the Captain while offsite. A spare parts list to be ordered can be generated and emailed to the yacht manager with the click of a mouse. Handover notes shared remotely with an inbound engineer prior to arriving. All of which result in the smoother operation of a program. “We are finding that more and more vessels are looking at yacht management software that can be used across departments. We believe this is partly related to the desire of department managers to collaborate more with their respective department heads and also have complete transparency with the Captain and yacht manager, if appointed” Says Matt Hyde, Director of Seahub. Beyond this, the increased demand from alternative departments come from a need to provide greater oversight and management of what is happening within their departments. Each department is accountable for a certain level of maintenance, inventory control and document management whether that be manuals, receipts or crew CV’s. A digital solution is the answer to providing a years old requirement with a twenty first century solution.